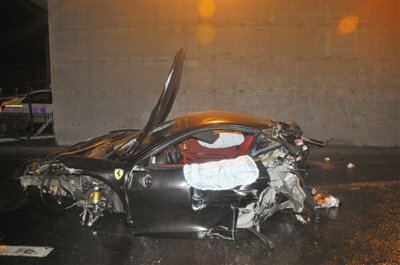 There was a fatal crash in Beijing, last Sunday around 4AM, involving a Ferrari 458 Italia with three inside. The car’s driver was killed and two women in her 20’s and 30’s have been taken to hospitals. The man is believed to be illegitimate son of one of China’s leading Communist Party members and the story gets really twisted from here. The government is apparently trying to hush it up, going so far as to ban the word “Ferrari” from online searches. But we are not in China and cannot be sure of the status quo.